Scientific Name: Order Lepidoptera, family Libytheidae. Two subspecies in Texas--Libytheana bachmanii and larvata (some books list three species in Texas). Size: Adult wing span--1 1/2" to 2"; larva--3/4" to 1"
Identification: Larvae are green, the color of lush green hackberry leaves, with yellow stripes along the top and sides. 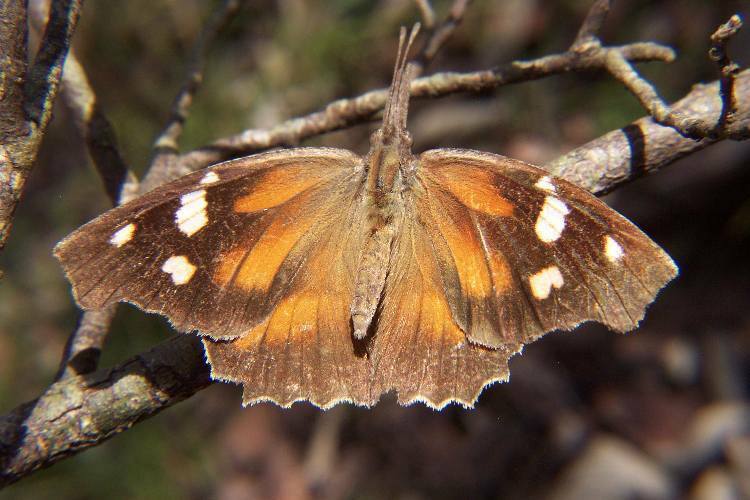 The adult wings are patterned: blackish brown with creamy white and orange markings. The adult has elongated mouthparts up to 1/4" long, forming the snout that gives them their name. We have noticed that the older butterflies usually lose the snout before they die. Biology and life cycle: Complete metamorphosis. Believed to mate at night. In good weather conditions the period from egg to adult may take only fifteen days. Up to four generations a year. Books we consulted say they overwinter as adults. An entomologist we consulted said they overwinter in the pupa stage. We believe that in Texas, at least in the southern parts, they do both. Feeding habits: Larvae chew mostly hackberry tree leaves. Adults have a tube for siphoning liquids from flowers and damaged fruit. Economic importance: Not considered damaging to crops. Adults and larvae are big in the food chain. After a big hatch, the adults are troublesome for drivers; they can quickly smear windshields and plug radiators. Insight: They seem to have the heaviest flights (in the millions) after rains break a long drought. Sometimes they seem to be migrating north. A few days later they may go south. It sometimes seems they are just milling around in no general direction. That's why the old-timers called them millers. Or maybe because of the flourlike powder on their wings. The larvae are interesting. If you bump a branch or disturb the leaf they are feeding on, they quickly fall to the ground. If you look closely, they have kept a silken thread attached to the leaf they were feeding on. After they have fallen a couple of feet, they slow their fall to a halt. They are excellent bungee jumpers. If they are on a low branch they may hit the ground. It takes the larger larvae longer to slow their fall. Once they have stopped their fall, they hold still for a few moments; then with a winding action of their head they start back up the thread to their original leaf. They can do this with amazing speed. If they don't stop their fall before they hit the ground and can't start back up on time, the fire ants usually get them. Cold conditions don't seem to hurt them. Malcolm kept some in a jar in the refrigerator for three hours, hoping to study them while they were inactive, but they quickly warmed up and flew away. Because of the variety of their heavy flights, they attract a lot of attention. Snout butterflies have been found in fossil shales in Colorado that are believed to be 35 million years old.